It was June and the geraniums and other flowers were out in abundance. Another attempt at an artsy photo. At least the focus worked like I planned. The tower of the abbey church at Vézelay. 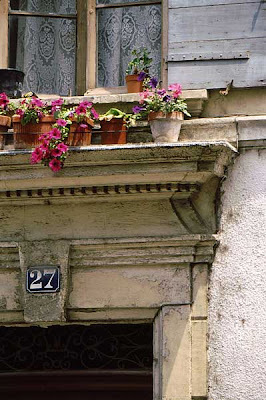 Flowers adorn this doorstep in town. We were watching the evening news the other night and Callie was looking for a little attention. She always gets it. ... a day makes. Tuesday morning we woke up to overcast skies and light rain. Much the same weather that we've been having for the past two months (with some exceptions). Wednesday morning the sun was back and our spirits were lifted. 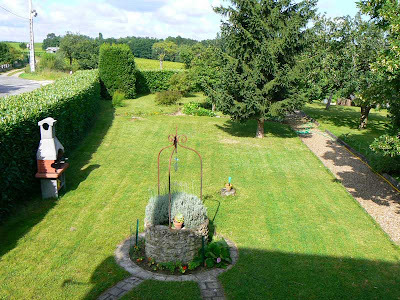 Both of these photos are from the bedroom window looking west over the part of the yard and the vineyard beyond. That little blueish-green thing in the center of the photos is a rain gauge. It's been getting a real workout since the beginning of May. 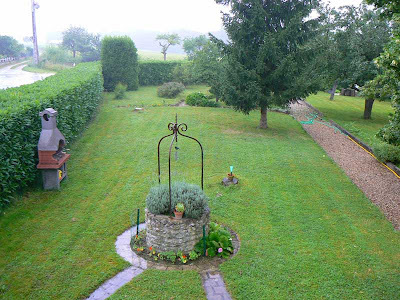 These past two months have been the rainiest May and June in the four years we've lived here, and the wettest in France since the 1980's. The sun didn't last. This morning is completely overcast and about 12C. Ugh. There's a documentary every Friday night on France 3 called Thalassa, le magazine de la mer. It's about two hours long with segments on anything and everything related to the sea. Last year, the show's general theme was coastal France. The crew traveled a section of the coast each week and did stories about the places they visited. This year, the general theme has been islands both off the coast of France and around the world. Two weeks ago, there was a special edition dedicated to an international group of scientists studying everything about a South Pacific island in an effort to identify and classify as many new species of flora and fauna that they could. My kind of show. 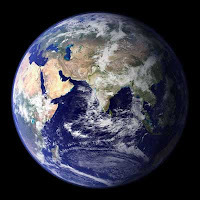 At the beginning of the program, the narrator talked about the antipodes they encountered. I wondered what species that was. Turns out it's homo sapiens ! Les antipodes are people on the opposite side of the globe from where you are. More accurately, l'antipode is the place on the opposite side of the earth from where you are. It comes to French through Latin from the Greek anti (opposite) and pous or podos (foot). I could do a whole series on our refrigerator (watch out, I might). Everyone knows that in Europe, including France, refrigerators are much smaller than those we're used to in North America. For most, I think it's a function of space, energy, and the fact that city people eat out or buy fresh food daily. Large quantities of stored food are neither necessary nor desirable. But the trend toward frigos américains is hard to resist, and now modern kitchens are being advertised with large side-by-side models that include water and ice in the door - something unheard of in France even ten years ago. When we moved to the countryside, we knew that we wanted something larger than an under-the-counter half-sized fridge, and we had the space for a good-sized appliance. Our choices were limited because we wanted a frost-free freezer. 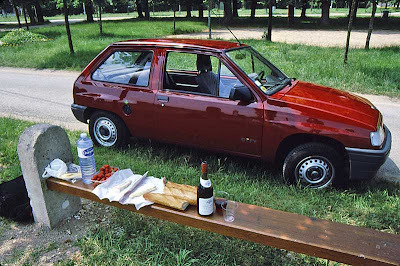 This is also a new trend in France. There are a lot more options today for frost-free than there were even four years ago. We also wanted a bottom freezer, but we could find no models available with a frost-free freezer on the bottom. The Chilled Room inside our refrigerator. We ended up buying a Samsung (yes, they make refrigerators) with an upper freezer compartment that's frost-free. It's a tad smaller than a standard American refrigerator, but it's big enough for us. Inside the fridge section, it's pretty much what you'd expect, except for this funny compartment at the top called the "chilled room." 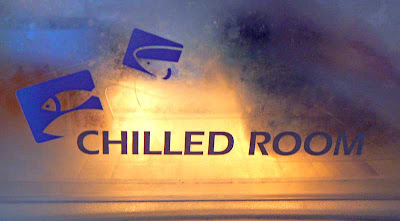 I thought the whole fridge was a "chilled room." Go figure. The little graphics on the door panel suggest that one should keep fish in there. We use it mostly for cheese and cold cuts. 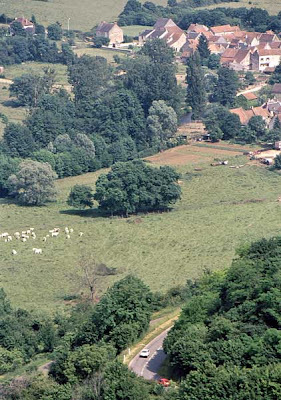 The abbey at Vézelay was founded in the 9th century. It was quickly relocated up onto a neighboring hill after it was destroyed by invading Normans. My friend Andy said that if we were driving anywhere near it, we should stop and see it, so we did. And we were glad to have done, because the place is beautiful. 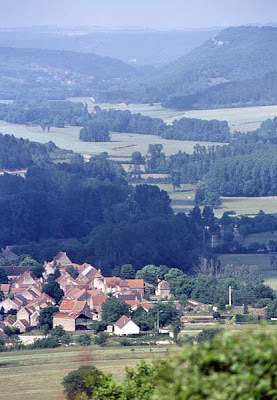 It's a small town ; about 500 Vézeliens call it home. The views from the grounds of the abbey are spectacular and a few of them are the subject of today's post. It was still quite warm when we were there and we wandered through the town and around the grounds of the abbey church. I'm sure we went inside the church, but I don't have any photos of that. Remember, this is 1993. I was working with a 35mm SLR camera with slide film. No digital yet. Taking photos inside was a function of the film speed I had loaded in the camera and whether or not I felt like taking the tripod out of the car. I think I left the tripod in the trunk while we wandered around Vézelay. Next time, some sights from up in the town itself. One of the plants actually enjoying the cool weather in our garden is the estragon (tarragon) that came up from last year's crop. So when we saw that chickens were on sale at the supermarket, we went out and bought a couple. 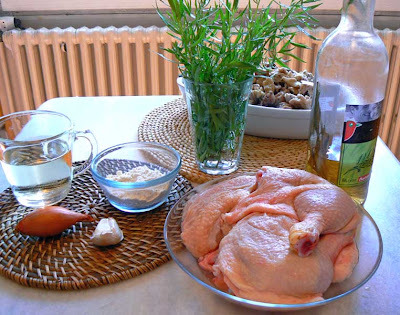 Last week I used one to make tarragon chicken. I adapted the recipe from The Hudson River Valley Cookbook by Waldy Malouf. The book was given to me by a fellow upstate New Yorker friend while we lived San Francisco - she was living in Seattle at the time. I didn't make this recipe until I moved to France. This is not the first time I've made the dish, but I have significantly altered it from the cookbook version. Malouf's recipe is a bit complicated with many steps. I know that the result is a very nice restaurant-style dish - I did it his way the first time. 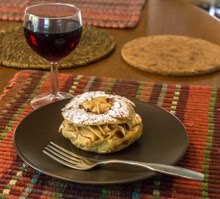 Since then, I've morphed the recipe into a French country home version, much easier to make at home, and it tastes just as good. First, I cut up a whole chicken, reserve the breasts, legs, and wings, then make stock with the carcass, herbs, and some aromatics. I don't do this every time - sometimes I use stock that's already been made and frozen, other times a bullion cube will do. It all depends on what's going on at the time I'm making the dish. The last time I made this I marinated the chicken parts overnight in wine and tarragon. I didn't do that this time. Next, I season the chicken and brown the pieces in some oil. I remove the chicken and sauté chopped garlic and shallot in the same pan, being sure to keep the good brown bits in. I then add some butter and flour to make a roux (still in the same pan). When the roux has cooked (but not turned dark) I add white wine, chopped fresh tarragon, and a splash of tarragon vinegar, some of the stock, salt and pepper, and reduce it by half. 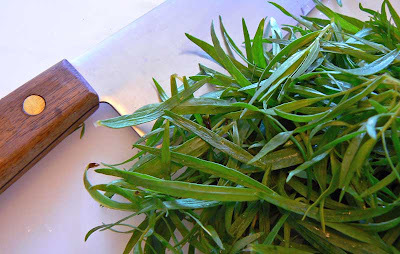 Fresh tarragon from the garden, stems removed, ready to be chopped. Then the chicken pieces and any juices go back in along with the rest of the stock. This goes into the oven uncovered for about 20 minutes. Just before serving, I add some butter to the sauce to richen it up. You can remove the chicken and strain then reduce the sauce in another pan before adding the butter to make it more elegant, but my rustic style is just as good if you don't mind the bits of tarragon floating in it. The main course is served ! My version turns out to be a one-pan recipe (using a sauteuse, pictured above), and the amount of each ingredient that you use is entirely up to you and your taste. This time I used a lot of stock and wine to make a good amount of sauce, but you can just as easily make less. You can reduce the sauce by half to thicken it more and to give it a more intense flavor, or do as I did and only reduce it by about a third. Also, the whole thing can be covered and held in a warm oven for up to half an hour if necessary. The appetizer of black radish (which is only black on the outside) and cheese. 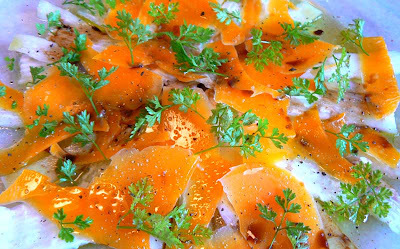 Our lunch started out with a salad of thinly sliced radis noir (black radish) and mimolette cheese with olive oil, balsamic vinegar, and fresh cerfeuil (chervil) from the garden. 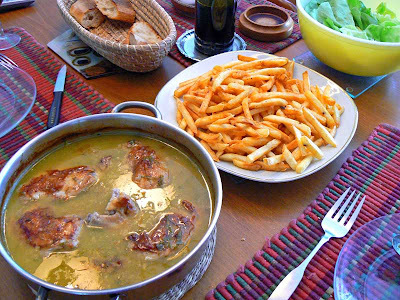 We served the main course with French fries and a green salad. These are the latest additions to Callie's collection of playthings. She collects them from everywhere. 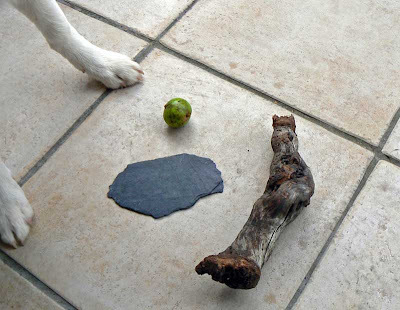 Clockwise from top : the Green Apple/Ball, the Gnarly Grape Vine, and the Bit of Slate. First is the Green Apple/Ball that fell from one of the trees out back. These premature apples look, apparently, like little tennis balls and she brings a fresh one into the house almost every day. And there is an endless supply of them. Our challenge is to find them before they end up rotting under some piece of furniture. Next up is a wine-country variation on the Piece of Wood toy : the Gnarly Grape Vine. Good for teething. It has a wonderful bouquet with hints of black cherry and roquefort. And last, but certainly not least, is the Bit of Slate. The slate was part of the cap on our chimney that we had removed years ago and she found it in a rock pile. She chews on this, too. More evidence, I think, that we're in full teething mode. 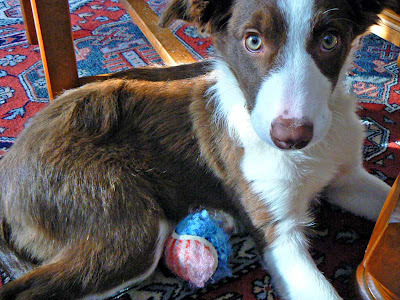 The upside, I suppose, is that we don't have to spend precious euros on fancy store-bought chew toys. Callie is four months old today. 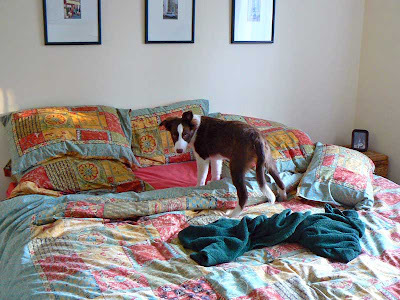 You can see how big she's getting once you know that this is an American king-size bed she's in the process of un-making. 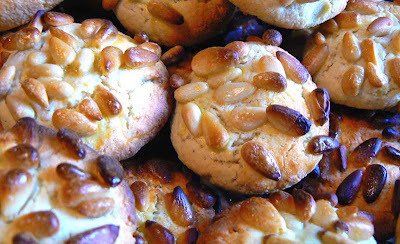 Biscuits aux amandes et pignons. We had some pine nuts in the cabinet that were just crying out to be used - we normally use them for pesto - and since I have no basil right now, Ken found this cookie recipe on the web. Beat the eggs and sugar until blanched. Add the grated lemon zest and the cinnamon. Stir in the ground almonds and mix until you get a thick dough. Form about 25 small balls of dough (use plenty of flour on your counter or board for this step to help keep the dough from sticking), then press them into the pine nuts. Arrange the cookies on an oiled cookie sheet, paint them with the egg yolk (mixed with a tablespoon of water) and bake in a preheated 230º C oven for 8-10 minutes (watch them - they'll burn fast). Cool on a rack and serve. As per normal, I was watching the news just after the parliamentary elections this past week and the newscaster used yet another word that I swear I've never heard before. And, as per normal, I've probably heard the word a thousand times and it just didn't register until now. Since the first round of elections two weeks ago, the right-wing ruling party was expected to bolster its majority in the National Assembly by historic proportions. Then they jumped the gun and (in my opinion) showed their true colors by prematurely announcing a proposal to shift part of the costs of the national health care system from employers to consumers by lowering business taxes and raising sales taxes. Ooops. The left-wing opposition seized on that. The issue resonated with the voters and the predicted "blue wave" of right-wing victories petered out. In fact, the right wing lost a significant number of seats in parliament and the left wing gained - even though the right still holds a majority. The newscaster said that the "blue wave" encountered un ressac. This noun comes from the Spanish resaca. 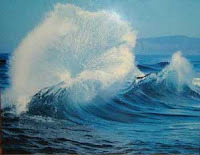 It describes what happens when a wave hits an obstacle (like a wall) and bounces back on itself and is thereby counteracted or significantly weakened, also known as backwash. I think the UMP (the majority party) got a bit cocky and experienced its first shot of reality after a heady victory in last month's presidential election. Un ressac indeed. I wasn't happy with any of the photos I took of this one, so rather than re-shoot, I messed with the pictures in photoshop to come up with this funky image. It's a bottle caddy, a ubiquitous item here in wine country. This one is made from antiqued steel and has a wooden handle to carry six bottles. We use it all the time to lug empties down to the cellar and carry filled bottles up. It has its very own spot on the floor next to a china cabinet and is good looking as well as useful. What's it called in French ? Un porte-bouteilles ? Maybe one of my French-speaking readers knows. Auxerre is one of those places that I've passed through a few times and each time I wonder why I don't linger a little. It's a small city that feels very lively, friendly, accessible, and comfortable. There are always a lot of people in the streets and its situation on the Yonne river is wonderful. There's a good football team based in Auxerre ; at least they have been good enough for someone like me, who doesn't really follow football, to have heard of. And they have a fan base of nearly 40,000 Auxerrois. 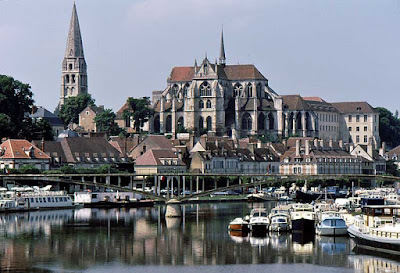 The cathedral of Saint Etienne on the Yonne river in Auxerre. On this trip we only drove through Auxerre on our way to Dijon for the night. It was my first time there, and this photo is proof. 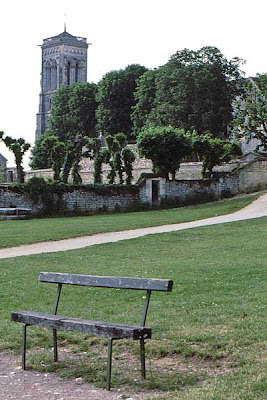 From Auxerre, we headed to Vézelay, a hill town with a famous abbey that my friend Andy told me we had to see. And we were right to leave Paris early. The weather was much more tolerable outside the city. 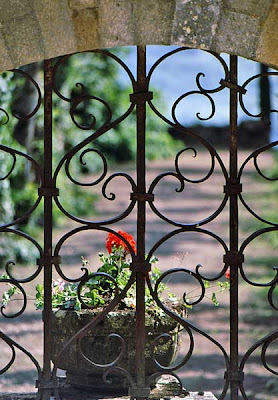 Don't fret - we'll get to Provence soon enough. So I've decided to delve back into the old slides for posting material. This time, it's Provence. Set the Way-Back machine to June 1993 . It was the occasion of our tenth anniversary together and Ken and I planned three weeks in France. 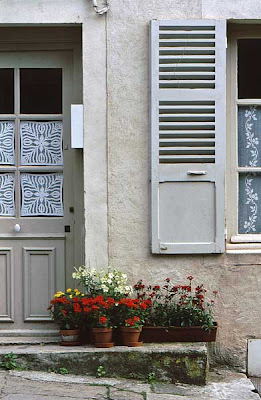 We rented a house in Provence for two weeks, with a few days on either end to spend in Paris and on the road. 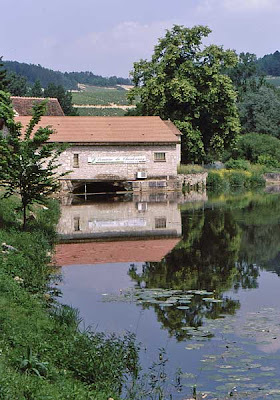 A mill on the Serein at Chablis. We arrived in Paris on Saturday, June 4. I remember checking into our hotel in the 6th arrondissement in such heat you wouldn't believe it. Steffi Graf was winning her third French Open (she'd go on to win three more), and we were roasting. After one uncomfortable night (sans climatisation) we decided to get out of the choking heat of Paris early and just drive toward the south. 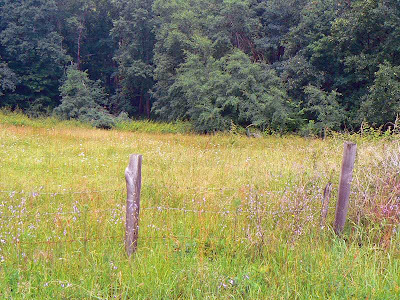 The countryside would be more comfortable than the heat of the city and we could find a hotel or two along the way. Our first picnic lunch of the trip : wine, cheese (there's a brie and what I think is a morbier), baguette, and a barquette of strawberries. 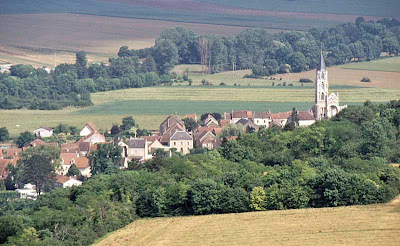 Our first stop was the town of Chablis. Well, not actually the first stop since we did stop to shop for our first picnic lunch. We found a bench along the little Serein river near the center of town with splendid views of hillside vineyards and set up our meal. Cheeses, bread, red wine, and strawberries like I had never tasted in my life. 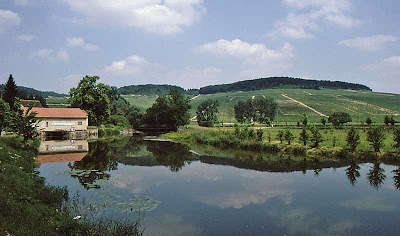 The view of vineyards from our picnic spot. Chablis is a small town of about 2,500 Chablisiens and we didn't spend much time there except to have our picnic and snap a few photos. 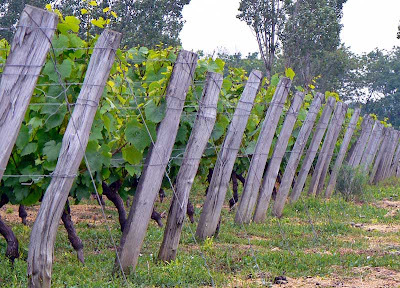 Chardonnay is the grape that the famous local wine is made from. I remember that when I was a teenager and first trying wine, anything red was called burgundy and anything white was called chablis. 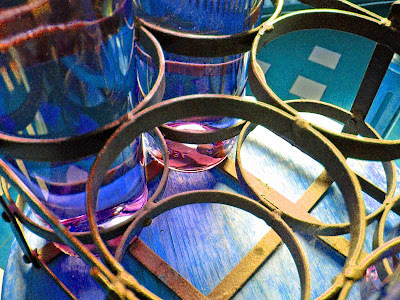 Except, of course, for that Blue Nun stuff I used to drink. That was a Mateus of a different color... Ah, the seventies. After lunch we wound our way through the countryside in the general direction of Dijon, where we would stay for the night. Yes, it's early Saturday morning and she's taking a brief nap. Time to slap a post together. So once again it's photos from the veggie garden. One of these days I'll start scanning more slides of France or actually leave the house and garden, but for now it's all domestic bliss. The artichokes are about three times as big as when they went in. We've had so much rain lately that I'm afraid the garden will wash away. But it seems to be doing well. 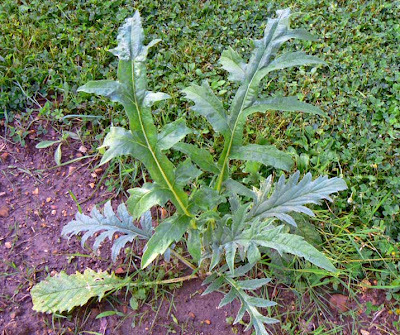 Especially the mauvaises herbes (weeds). But they're not getting me down, at least not yet. And don't let the shadows in the pictures fool you. The sun was out for about five minutes when I took theses shots. I had some trouble with older seeds not sprouting, so I've had to re-plant some stuff, but that's done and we should be under way again soon. What has come up is doing well, and the 'maters and the eggplant are already setting blossoms. Yellow squash is coming along fine. I'll have to thin these out in a couple of weeks. The zucchini is at the same stage, as are the cucumbers. There's also a second crop of rhubarb coming up. A few of the okra seeds sprouted, so we should have some of those this year. In between, where the seeds didn't sprout, I'll plant another crop of green beans. I keep reminding myself that it's still spring, and that we have all of summer yet to come. 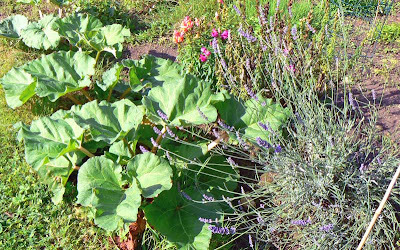 A second round of rhubarb in the "herb" garden, along with the lavender whose flowers are turning that characteristic blue. Now I need to go through my seed collection and throw away all the old stuff so I don't have to go through this again next year. Anybody got one of those, whaddya call it, round tuits ? That's MY tennis ball. Don't even think about it. But no one ever does anything about it. That'll be the weather. This year the weather is driving us nuts. Not because it's been bad or violent or anything like that. It's just been weird. 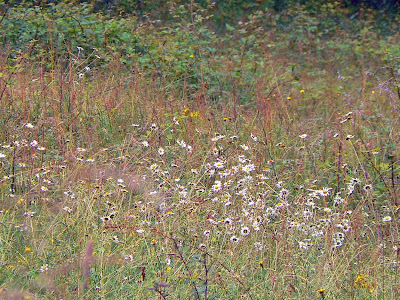 The grass and wildflowers are thriving in a nearby meadow. We hardly had a winter, and then April was like June should be. May turned cold and soggy. And now that it's June, well, I don't know what to make of it. It's the most humid weather I think we've had in the four years we've lived here. Warm humid, then cool humid, then rain, then thunderstorms. The grass it growing, but cutting it is a challenge. I have to check the day's weather forecast several times to see if it's a good cut day. The grass has to dry out first, of course. That means a few days of dry weather in a row. The longer the grass gets, the longer it takes to dry out. And it takes a about an hour and a half to do the whole thing. The ends of rows of vines out in the vineyard behind the house. They're spraying a lot out there - either it's because it's very buggy or the rain washes off the insecticide as soon as they put it on. The garden got in late because May was soggy. Most of my pumpkin seeds didn't sprout (I don't know why) so I've re-planted and will be lucky to have pumpkins by Christmas, let alone the fall season. Today t-storms are predicted. Do I water the garden ? Do I wait ? Arrrgh ! And the bugs. Don't get me started on the bugs. There are many more bugs this year due to the lack of freezing weather last winter. At least that's what the old wives say around here. And they bite. The bugs, not the old wives. 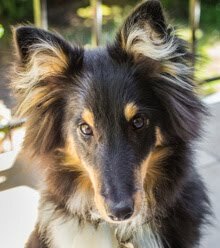 Our arms and legs are covered with bites and I'm constantly pulling ticks off the dog (before they attach). I'm not really complaining. I've seen on the news the awful weather they've had (violent wind, floods) in other parts of the country, not to mention tornadoes in the US and severe drought in Africa, and we're not (thankfully) having do contend with anything close to those conditions. And on the up side, the cherry trees are amazing this year. All the free cherries we can pick and then some. I've made pies, clafoutis, and today Ken is making duck in a cherry sauce for our lunch. Callie loves the tall grass. So do the ticks. It's not even summer yet. But it will be soon. As Nat King Cole once sang, roll out those lazy, hazy, crazy days of summer ; those days of soda and pretzels and beer... I'm ready for 'em. I've known this verb for many years from an old song by Alain Souchon called Papa mambo. The song's refrain is On est foutu, on mange trop, mais qu'est-ce qu'on fera quand on sera gros (we're screwed, we eat too much, what'll we do when we're fat?). 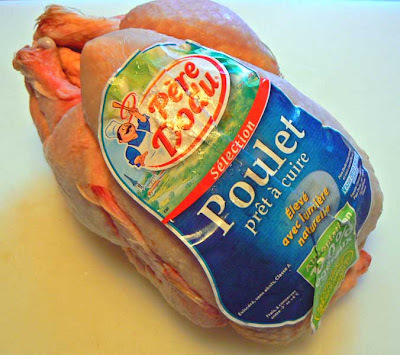 The particular line with this week's word is l'albatros patauge dans l'ice cream. 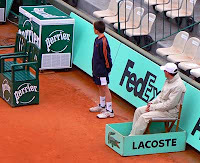 I was reminded of it over the weekend when one of the commentators calling a tennis match at Roland Garros said something to the effect that the players (it was a doubles match) pataugeaient dans la terre battue. 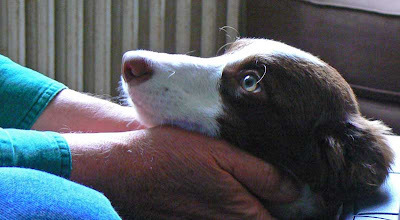 The verb patauger comes from patte, which means an animal's foot, or paw. It means to splash around as in water or mud. It also means to lose your way or to be unable to get out of a situation. I'm not sure what the commentator's intent was ; were the players actually just tromping around in the clay or were they unable to get out of the sticky situation they were in ? 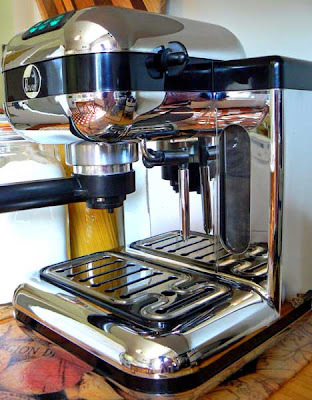 The espresso machine was a gift. When I left my job in San Francisco, one of the the groups of people I worked with pitched in and presented me with this amazing machine (thanks R.B.!). They called Ken to find out if I would like it, what features I would enjoy, and then presented me with a photo of the machine inside a card at the good-bye party. The machine was delivered a week or so later. I used it nearly every day during the next year while I was doing consulting work. I was lucky to be able to work from the house that year - the year just prior to our move to France - and I looked forward to my daily espresso. When it was time to move, I didn't want to give up the machine, so we had it packed with everything else and moved it with us. It's one of three American appliances we brought with us (the others are the food processor and the Kitchen Aid mixer). To use them on the French power system, we had to buy a transformer that would handle them. We found one on the internet and it works like a charm. I don't make espresso as often as I did that first year in SF, curiously enough. But when I do, the machine works great and reminds me of the great group of people I worked with back then. 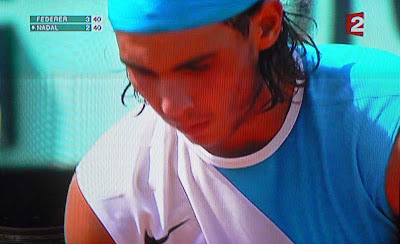 They traded sets to begin, but after it was all Rafael Nadal in this year's final at Roland Garros. Roger Federer couldn't keep up with the Spaniard. It was a good match, but far from a nail-biter. 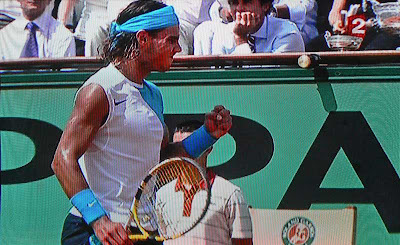 Nadal pumps his fist after a winning shot. One of the cool things this year was that France Télévisions (France 2, 3, and 4) broadcast the tournament in 14:9, which is a wider format than normal TV. Movies, for example, are shown in wide screen 16:9 on our movie stations while most TV shows are broadcast in the familiar 4:3 (almost square) format. I captured these two shots from the TV with the camera just for fun. They're pretty much the actual dimensions of the TV picture. The clay court season is over for another year. Now it's time for the short grass court season, which culminates at Wimbledon in two weeks. The score was close early in the first set. Eurosport is carrying the Queen's tournament in London all week. Hewitt won it last year and Roddick the two years prior. We'll see how they do this year. Just a quickie for today : our vegetable garden. It doesn't look like much now, but you can see by where the stakes are that it's full of little tomato, eggplant, and pepper seedlings, all growing. We're expecting a warm sunny day today and that'll help things along nicely. I'll post more progress photos over the summer. Claude, camera at the ready, relaxing on the terrace. Ken and I made lunch for Claude (Blogging in Paris) while she was in town this past week. We started out with an entrée of roasted red peppers in olive oil and radishes with butter and bread. 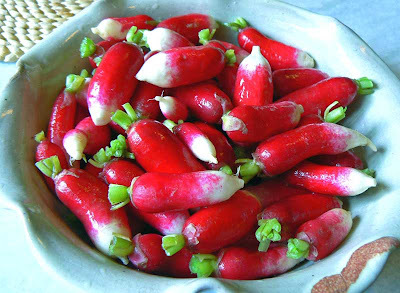 Radishes are served ! They're great with salt, sweet butter, and a baguette. 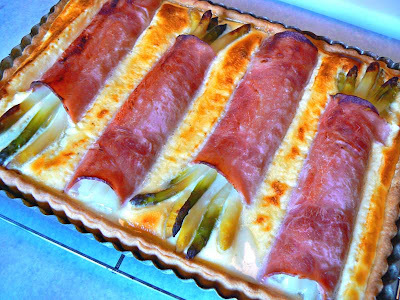 The plat du jour was the asparagus tarte that I've been making this spring with ham and a cheesy custard. Asparagus season is beginning to wind down now, so I probably won't do this tarte again until next year. We followed it with a grated carrot salad in vinaigrette on a bed of lettuce and finished the meal with a cherry clafoutis. The tarte aux asperges, fresh from the oven. It was all washed down with a local rosé and lots of good conversation. And the weather was perfect ; we sat outside on the terrace with a wonderful view of the greenery all around. 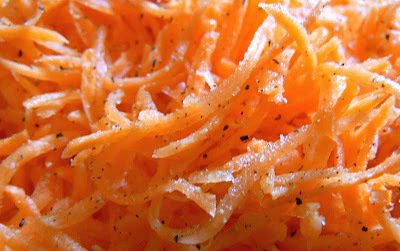 A close-up of grated carrot salad served with a mustardy vinaigrette. This week, Callie discovered mud puddles and the fact that she likes them. We went for a walk after our day of thunderstorms earlier in the week and the vineyard was a muddy mess. 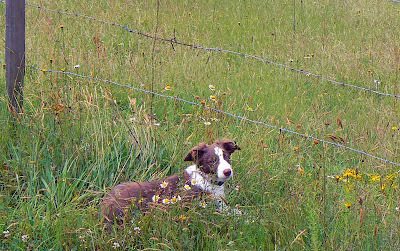 But that does not deter a sheep dog, no sir. 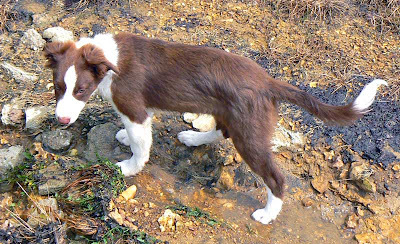 She ran through - and drank from - just about every puddle and mud pit she encountered. What a dirty dog she was when we got home ! Callie goes in for her second vet visit today. It's time for a vaccination booster and a weigh-in. She weighed 5.8 kilos (12.8 lbs) at her first visit a few weeks ago. It'll be interesting to see how she deals with the car. So far, she hates it. The last few times - and there have only been a few - she has cowered on the floor hating every minute of it. One day, though, something will click and she'll beg to go for rides in the car. Baby steps... baby steps. Last night, when I took her outside one last time before bed, she found a frog/toad in the yard and chased the poor thing for a while. I don't know if it spit at her or sprayed her (what do terrified frogs do ? ), but she did try to grab it in her mouth - she turned it over a couple of times - and came back with what seemed like a yucky taste in her mouth. Maybe there's something on the frog's skin that's distasteful to predators. She wanted to play some more, so I had to scoop her up and carry her back into the house. Ribbit. The vegetable garden is taking shape. The seedlings are doing well, and many of the seeds that we planted are sprouting. 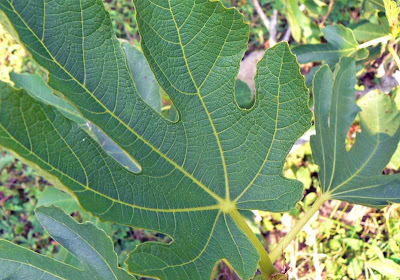 These are some of the leaves that we see right now. 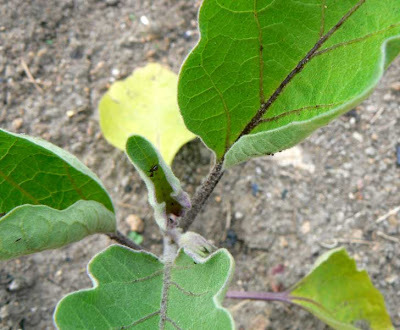 Aubergine, or eggplant. I bought six of these seedlings from a grower at the outdoor market in Selles-sur-Cher. Our figue, or fig, tree is getting bigger every year. There should be a small crop of figs this year. 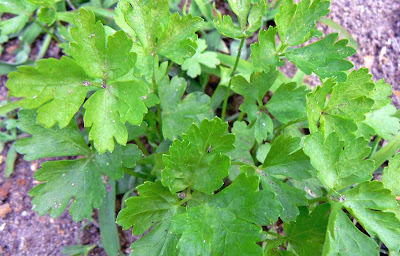 Persil, or parsley, coming up from seeds I planted in the herb garden. 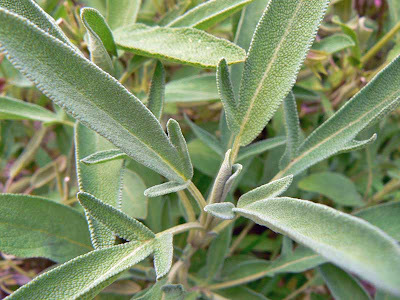 Sauge, or sage, grows like weeds in our garden. It just finished flowering for the season. Tomates and poivrons (tomatoes and peppers) are doing well, too. We started the tomatoes from seeds and I bought the peppers from the same grower where I got the aubergines. 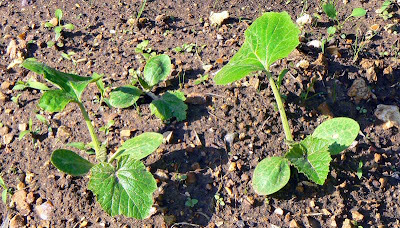 The courgettes and concombres (zucchini and cucumbers) have sprouted, as have some of the haricots verts (green beans) and gumbos (okra) that I planted. We're still waiting for the mustard greens - I don't know what they're called in French. I also planted a separate pumpkin patch with French potirons and American pumpkins, along with some winter squash called sucrine (kind of like butternut) and I noticed the first of those seeds is poking up this morning. Some of those seeds are old, so we'll see what comes up. 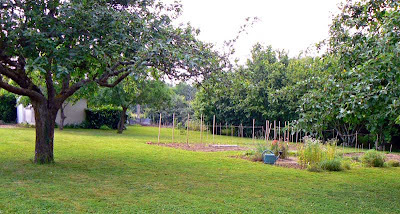 The garden is kind of late this year owing to the cool and wet month of May that we had. We should have started more seeds indoors. We could have planted in mid or late April, but you never know about frost in early May. You can count on more updates and photos of the garden in coming weeks. This week's word was suggested by Claude from Blogging in Paris. 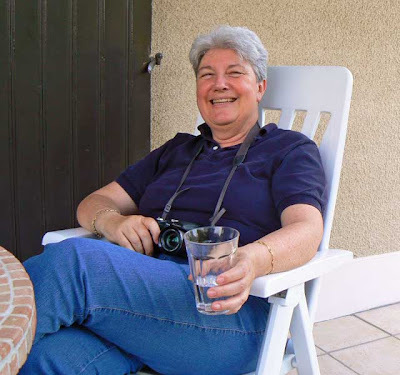 She's visiting Saint-Aignan this week and came by to see us. While showing her around the house, we passed through what we call the utility room. It's the place were the furnace, water heater, storage units, and washer and dryer are located. Claude said, "Ah, la buanderie !" I of course had to ask what that was and she said it would make a good word of the week. Et voilà. 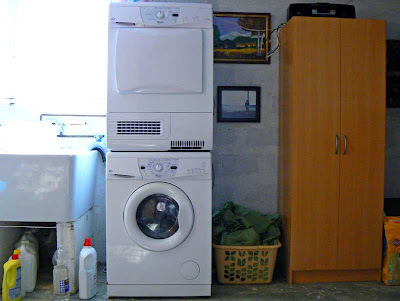 La buanderie is the place in a house where the laundry is done, in other words, the laundry room. It's a form of the noun bouandier (ière) which refers to the workers who do laundry on an industrial scale. From what I can tell, it comes from an old verb buer, to do laundry. That word's origins are from gallo-roman times. This started out to be about lazy susans, those round things that spin. For years I've had two tupperware susans that I use to hold spices. The rotating platters make it easy to store and find spices and dried herbs. But my lack of patience for taking photos these past few weeks (read : dog) prevented me from getting the well-studied and properly lit close up I was aiming for. 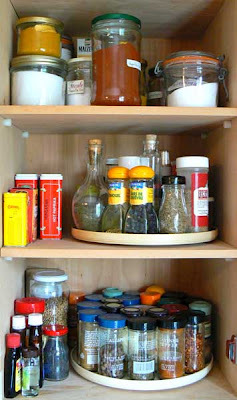 So we settle for a shot of the whole spice cabinet, with the two lazy susans at least visible if not exactly featured. Most of these jars are older than the hills, remaining in service much longer than intended. Much like Bush's army, but with much more pleasant results. Sorry for the dose of politics ; I just thought I'd spice things up a bit. Ba-dum-pum. We buy most of our spices in large quantities and transfer small amounts to the kitchen jars as needed - the rest is stored in the downstairs pantry.